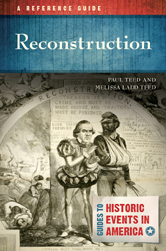 Reconstruction: A Reference Guide covers the entire period of Reconstruction (1863-1877) with a special emphasis on the struggle for social and political equality in the post-Civil War South. The book's analytical essays, selection of primary documents, and biographies of key participants give readers an understanding of social, political, and economic changes that occurred during this important period as well as provide opportunities to explore more specific issues and debates. Counterfactual Essay: Would Reconstruction Have Been Different If Lincoln Had Lived? Defining Moments Essay: How Did the Passage of the Southern Black Codes Change the Direction of Reconstruction? Perspectives Essay: How Radical Was Radical Reconstruction?